Associate Professors Greg Haff and Sophia Nimphius, Brennen Irvine and Drs Fadi Ma'ayah and Jodie Cochrane Wilkie. Photo: Justin Benson-Cooper/The Sunday Times. When the difference between glory and obscurity can be measured in millimetres and microseconds, professional athletes must strive for every advantage on the field. This means that to succeed, modern sporting teams work closely with sports scientists who are continually developing new ways to push the boundaries of human capability. It’s a role that requires remarkable trust, says Professor Rob Newton, Associate Dean of Medical and Exercise Sciences at Edith Cowan University. For an athlete whose physical performance means everything — and whose body is their greatest asset — all the measurements in the world are meaningless if scientists can’t develop strong relationships with both athlete and coach. “It takes a huge amount of trust for an athlete or coach to follow your advice as a sports scientist,” Newton says. “The main way to develop this trust is to be able to answer the questions that athletes and coaches have. Newton says this is the approach preferred by ECU sports scientists, who have now helped athletes across the globe get on their game. Researchers have helped make Australian and international athletes stronger, faster and more durable — a record that has seen the school ranked in the top 20 sports science research teams in the world. “We are always ready to engage with industry collaborators and elite sporting clubs from the West Coast Eagles to teams in the NBA and NFL in the United States,” he says. “People find us very accessible and easy to work with. Speed is one of the keys to success in modern soccer. Staying ahead of the game in a sport that gets faster every year is something Dr Fadi Ma’ayah spends a lot of time thinking about. The coordinator of ECU’s Sports Science and Football course, the only course in Australia to offer students a specialisation in either AFL or soccer, has been working with the Perth Glory squad since 2011. His work with the team has focused on improving a player’s running speed, acceleration and stopping times — all vital for excelling in the fast-paced modern game. “All the research and data shows that the game is getting faster and there are more periods of high intensity,” Ma’ayah says. With softball returning to the Olympics for the 2020 Tokyo games, there is renewed interest in the sport in Australia. Associate Professor Sophia Nimphius has been working with the WA Flames women’s squad in the lead-up to selection of the national team later this year. “Working with the Flames, we were able to increase the batted ball velocity (how fast that ball flies off the bat) by about 9 per cent, or 8km/h, which obviously puts a lot of extra pressure on the defence,” Nimphius says. “From a throwing perspective, we increased velocity by 6 per cent, or 5km/h, and sprint speed to second base also improved by 2 per cent. Work conducted by biomechanics lecturer Dr Jodie Cochrane Wilkie is beginning to pay dividends on the badminton court. A talent identification program she developed several years ago has helped to identify Australian badminton star Gronya Somerville. Now ranked 25th in the world, the badminton doubles specialist works with Cochrane Wilkie to help her reach her goal of winning a medal at the 2020 Tokyo Olympics. “Last year at the Australian Institute of Sport we used reflective markers and infrared cameras to complete a full 3-D motion analysis of each athlete,” Cochrane Wilkie says. 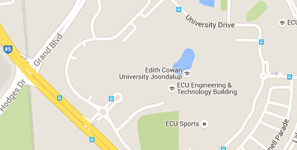 ECU Football Science students have the chance to work with the West Coast Eagles. It’s not just established sports science researchers helping athletes achieve seemingly superhuman feats. Each year a select group of Football Science undergraduate students work with the West Coast Eagles’ performance management team, getting hands-on experience with the highest profile sporting team in Western Australia. In 2017 ECU signed a 10-year agreement with the West Coast Eagles that has confirmed the opportunity for students to work with the club, while allowing the team to tap into ECU’s world-class sports science researchers. The students help track the activity of athletes, learning not only about the process of measuring performance but gaining insight into what makes AFL players most successful. Luke Hyde is the Performance Analysis Manager for the West Coast Eagles. “Whilst at the Eagles the students perform numerous tasks in supporting the club's performance analytics team, collecting and interpreting data, and filming and coding vision as required,” he says. Professor Ken Nosaka has turned his expertise in eccentric exercise into support for the Malaysia National Rugby Sevens team. After working extensively with the National Sports Institute of Malaysia, Nosaka was asked to help the team prepare for the 29th South East Asia (SEA) Games, which was held in Kuala Lumper in August 2017. To improve muscle function, especially speed and power, Professor Nosaka put the team through a nine week eccentric resistance training program before the SEA Games. “Eccentric exercise is where the load is placed on the muscle when it is lengthening rather than shortening,” Professor Nosaka said. “I set up a program where the players performed leg presses, but the focus was on lowering instead of lifting the weight. The research that results from these athlete and team partnerships can be highly useful and applicable across sports and training regimes, opening up new options for improving athlete performance. “ECU’s exercise and sports science research has been highly recognised in the world,” Nosaka says. The Jacksonville Jaguars reached the NFL Conference Finals in 2017 for the first time in 10 years. When the Jacksonville Jaguars wanted to improve the ways they trained their players, and to ensure they were at their strongest in critical moments during the NFL football season, they turned to ECU’s Associate Professor Greg Haff. The Jaguars were particularly interested in Haff’s expertise in the training paradigm known as periodisation. “Periodisation is a very careful and calculated way of planning an athletes’ training regime,” Haff says. “It takes into account not just the strengths and weaknesses of the particular athlete but also considers recovery, nutrition, and the impact of travel during the competitive season — essentially anything that can impact their performance in even a small way. Haff, who also serves as President of the National Strength and Conditioning Association, says his work seems to have paid dividends, with the Jaguars making the NFL Conference Finals for the first time in ten years in 2017. “It is likely that our work was a part of the overall transformation of the team,” he says. Six ECU sports science researchers have worked with 184 top Sri Lankan athletes in a research program led by Associate Professor Sophia Nimphius. With the goal of familiarising Sri Lankan coaches with the data that could be collected by sports scientists, the athletes were run through a battery of tests using specialised equipment brought from Australia not normally available in Sri Lanka. “Sports scientists can collect all the data in the world, but if coaches aren’t able to use and interpret that data to help them make better decisions then it is of very limited use,” Nimphius says. “So we were keen to expose the Sri Lankan coaches to all of the information that can be collected when testing athletes. A second trip to Sri Lanka is being planned for late 2018, where researchers will be accompanied by 20 undergraduate sports science students. “This is a fantastic opportunity for our students to put everything they are learning into practice,” Nimphius says.